Woodland Papercuts: New Autumn collection! The Autumn collection of my papercut ketubot line is now available to purchase in the Urban Collective shop! Comprised of 10 new designs featuring pomegranates, birds and flowers, this collection celebrates nature's more demure side. Traditionally, ketubahs are used in the Jewish faith as a marriage contract between the bride and groom. The highly stylized and ornamental posters are traditionally gilded and adorned with highly detailed papercut imagery, and couples frame and hang them in their homes. These days, the ketubah is used in secular society to display the newlyweds’ wedding vows or love poems, and they are also commissioned for anniversaries and other special occasions. The papercut ketubot are a collaboration between Naomi Shiek of Woodland Papercuts and Jennifer Raichman of the Urban Collective. The papercuts are designed and hand-cut by myself, Naomi Shiek, using the best artist tools and paper. They are a separate layer placed over Jennifer's big colorful prints. Jennifer offers a range of texts that will work for many different backgrounds, including: secular, reform, conservative, orthodox, interfaith, anniversary, vow renewals and more. You can provide your own text and she can translate it into Hebrew for a small fee as well. 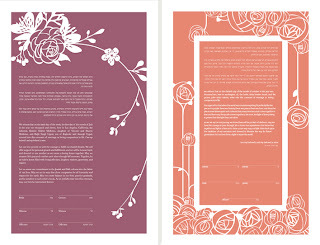 The ketubahs can be printed in any color you'd like to match your wedding colors. Handmade with the finest materials to last forever, these ketubahs are true heirlooms. The papercut ketubot are sold by the Urban Collective in the US & Canada. For international orders contact me or Wendy who's in charge of orders at the Urban Collective. You can see more of the 2011 Summer and Autumn collections on my blog here.